What other restaurant can you think of that serves its sandwich with a spoon? The Tendermaid sandwich is more like a sloppy joe than any burger: ground beef – not saucy – served in a steamed bun. You’re welcome to order it with cheese, ketchup, mustard, pickles, and onions, too. 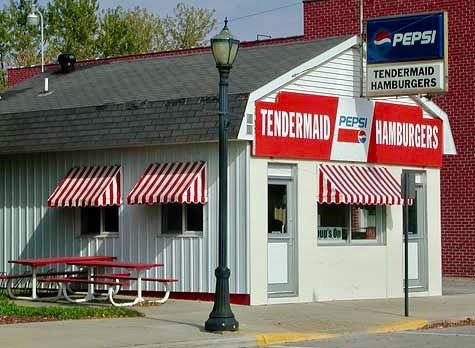 It’s a simple concept that has stood the test of time, if the restaurant’s retro look is anything to go by. Do stop in to try this unique sandwich next time you’re in Austin Minnesota, the Spam capital. It’s back to school time so this easy dinner is a real time saver. Enjoy my version of a Tendermaid Sandwich! Meat: Sauté beef and onions until cooked then drain and return to pan. Add the rest of the ingredients then simmer for 30 minutes. Steamed Buns: Start a little water boiling in a double boiler or Chinese bamboo steamer and put the buns in the top part with no water for about 20 seconds. That’s all they need. Or take a sheet of paper towel and lightly sprinkle it with water until about 20% of it is wet. Wrap the buns in the moistened paper, and microwave for about 10 seconds. Serve: Scoop onto buns & serve with condiments of your choosing. And don’t forget to eat with a spoon. From my cousin Laura’s kitchen. She is an amazing cook! Thank you again for sharing this with me and my readers. This recipe is great for using up excess garden harvest when the zucchini and tomatoes are out of control and you need to use them up. She always feels better when She uses as much of my garden harvest with as little waste as possible. The sauce this makes is more of a tomato broth. It is light and very flavorful. After all, you are using the best ingredients from your garden! She likes to use a combination of ready ripe tomatoes and also ones that are on the very firm side. Using almost ripe or barely ripe tomatoes is beneficial to the ‘sauce’ because tomatoes that are a little less ripe are higher in pectin which is a natural thickener. Note – Mix together and spread on top. Cut up all veggies as directed above. Layer 1/2 of all of the veggies in the bottom of the pan and sprinkle with 1 tsp salt. Sprinkle your chicken with salt and pepper. Then sprinkle with a dusting of all purpose flour. Heat olive oil in skillet and brown up your chicken. This is what is going to give your chicken the best flavor so don’t be too tempted to skip this step. Once you have browned your chicken really well, transfer to foil pan with all the drippings. Top with the rest of the veggies and the seasonings. Go ahead and cook it fresh right away, or chill overnight in fridge then transfer to your deep freeze for later. If you are going to freeze this in a foil pan, cover the top with a layer of wax paper or parchment. 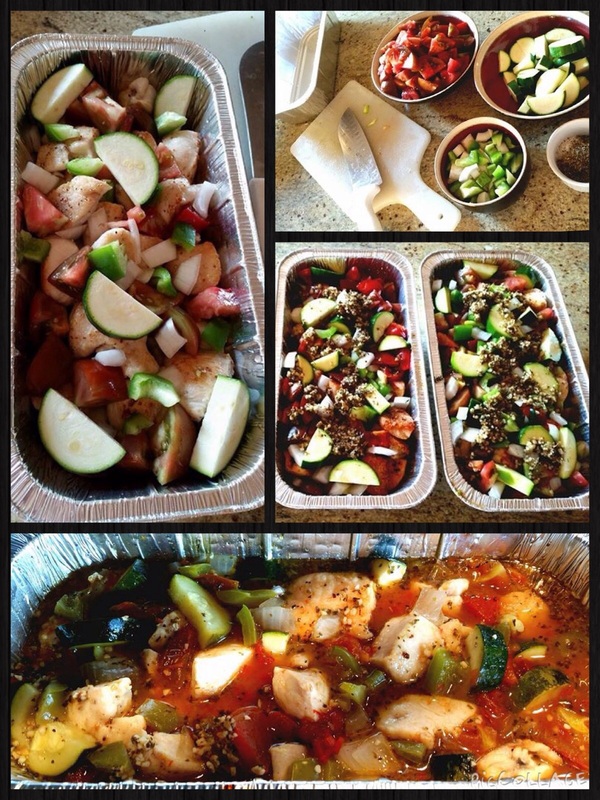 From Frozen – Thaw in fridge overnight: 350 for 2-3 hours covered. Serve with pasta or rice topped with shaved Parmesan. Prep Day: Combine rice, southwest seasoning and water in a saucepan, and bring to a boil. Reduce heat to low. Cover and simmer for 35 to 40 minutes or until rice is tender. Remove from heat and cool. Place black beans and pinto beans into a colander or strainer; rinse. Add corn, onion, spices and salsa, and toss to mix. Transfer to a large bowl, and mix in rice and cheese. Divide the mixture evenly among the tortillas, and roll up. Freeze wraps in single layer on lightly greased cookie sheet. When fully frozen, wrap individually in foil or plastic wrap. Place wraps in large zip-top freezer bags; freeze. Serve Day: Unwrap wraps from foil or plastic wrap. 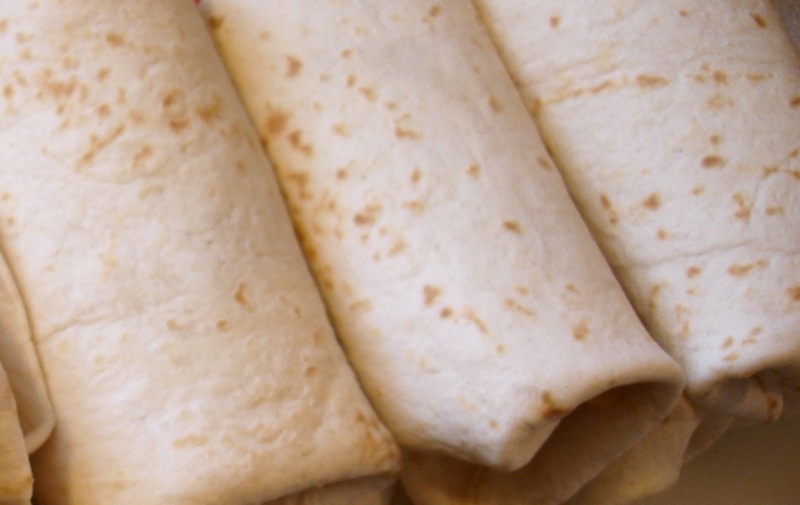 To heat using microwave, wrap in a paper towel. Cook in microwave until heated through, approximately 2 minutes at 70% power. To heat in oven, thaw wrap. Remove plastic wrap if used in freezing and wrap in tin foil. Bake at 350F for ten minutes.